If you aren’t making popcorn on the stove yet, then we need to change that ASAP. It comes together just as quickly as microwaved popcorn and costs a fraction of the price. Plus you can have complete control over the ingredients. I will show you how in a quick and easy how to guide that will change movie night forever. I received this product from Moms Meet (momsmeet.com) to use and post my honest opinions. Compensation for this post was provided and this page may contain affiliate links, however as always, all opinions are my own. With drive in movie season right around a corner, I thought it would be a great idea to share a quick and easy how to guide on making popcorn on the stove. 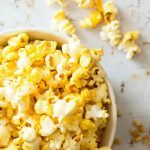 If you have been making popcorn in those little microwave popcorn packets for all these years, then the stovetop version can seem a little daunting. I will hold your hand, and it will be a cinch, I promise! What Oil Should I Use When Making Popcorn on the Stove? I have about 6 different cooking oils sitting in my kitchen right now, and each one has a completely different purpose. I have my expensive Australian olive oil for drizzling on freshly made salads. I have my truffle oil for fancying up some potato and leek soup. I have avocado oil for everyday sautéing and I have coconut oil for adding some healthy fats to smoothies and for giving my skin some extra moisture in the colder months. As more and more consumers demand their food products to be GMO-free, many producers are using palm oil to fulfill this requirement. When used at high heat, some oils begin to degrade or lose their nutritional value. Palm oil, on the other hand, has a smoke point of 450 degrees Fahrenheit, which is much higher than other oils. Olive oil begins to degrade at 380 degrees, canola at 400 degrees and coconut oil at 347 degrees. Additionally, palm oil has a neutral taste. Malaysian Palm Oil produces sustainably-sourced palm oil which is healthy for the planet. Malaysia is the first to produce certified sustainable palm oil in 2008. By the end of 2019, Malaysia expects to be 100% certified sustainable throughout the country. When purchasing palm oil or any products containing palm oil, be sure to check that it is sustainably sourced. I have just shared a handful of the benefits of Malaysian palm oil with you in this post, but there are so many more benefits that can be found at palmoilhealth.org. What Flavors and Seasonings Work Best With My Popcorn? matcha green tea makes for a great alternative flavor that is becoming super popular, add in a little bit of sea salt and you are good to go. Sprinkle on as much or as little you need to get the flavor that works for you. Pop the fresh popcorn in big bowl, give everything a good shake and you are all set. What flavor is your favorite when it comes to homemade popcorn? I love hearing from you, so be sure to pop back and leave a comment. Happy eating. If you aren't making popcorn on the stove yet, then we need to change that ASAP. It comes together just as quickly as microwaved popcorn and costs a fraction of the price. Plus you can have complete control over the ingredients. I will show you how in a quick and easy how to guide that will change movie night forever. Add the oil to the pan (see notes), along with 3 kernels of corn. Cover and heat over medium high heat until the kernels pop. Remove the pan from the heat, remove the popped corn. Put the pot back on the stove over medium high heat with the lid slightly askew so steam can escape. Give the pot a few shakes. Once popping begins, the corn will pop very quickly so be sure to stay and monitor. When the popping has slowed down, immediately pour into a large bowl. Toss with your favorite seasonings and serve. Take note of the pans bottom. Thinner pots which heat up more quickly are preferred over high-end, heavier bottomed pots. How long you wait for the kernels to heat up will depend on the pot you are using. Waiting enables the kernels to come to temperature evenly and pop at approximately the same time. Otherwise, some kernels pop early and may begin to burn before the others have popped. Popcorn kernels pop when the water vapor inside the kernel expands under heat. Once popped, however, this water vapor can turn popped kernels soft. Quick popping and a vented lid will help keep your popcorn crispy. Interesting why you’d use palm oil and also reading about it’s health benefits. 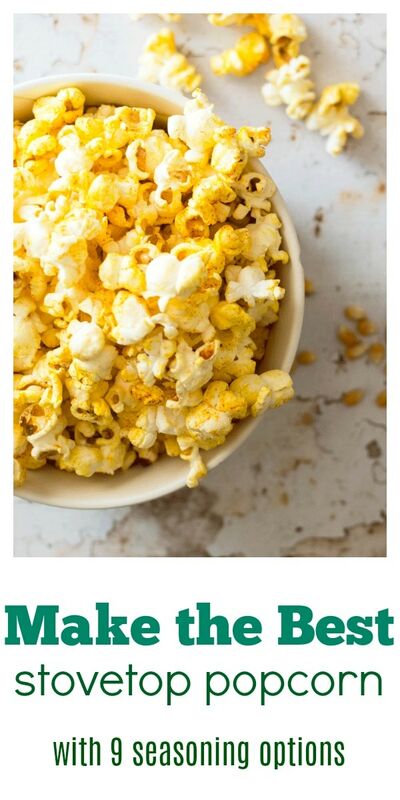 You’ve made this look easy and I’ve never made popcorn on the stove so I’m going to give it a try and see if mine turns out as good as yours! Your’s looks delicious as does the choice of spice. Hope it turned out well! I used palm oil in this instance because it has such a high heat point and you have to get the oil really hot in order to make the popcorn. I have also used coconut oil and it works great. It also gives the popcorn a great color like you would get in the movies but without having to add coloring! I love this wonderful guide to cooking popcorn on the stove! I also love how you included reasons for using Palm oil, as well as some yummy spice-mix ideas! I love making popcorn on the stovetop. We used to do it often when I was a kid. I got away from it (and used microwave popcorn), but it’s so simple and there aren’t all the nasties to deal with. And season as you like! Great post!